Super dissappointing and underwhelming. I Booked through booking agent Agoda. When we arrived reception told us none our requests had been communicated to them. Then told us it’s a known issue which happens to many customers but there is no plan to correct anything and it’s just too bad. So after a 19 hour flight our early check in (which was approved thru Agoda) wasn’t available. So we had to just walk around for 7 hours. No offer to leave bags or freshen up and when we asked it seemed like it was all too hard. Imagine the opposite of friendly or welcoming. Reception couldn’t answer any questions we had with regards to the city tax (all we wanted was information) it seemed like having customers was a burden. When we finally got to the room it was a double bed instead of two singles. (Twin was approved by Booking agent) When I asked to change I was told there is no option but possibly on the second night. I had so many places to choose from to stay and I wouldn’t have picked somewhere that didn’t suit basic needs. On the second night we were told that a room with twin beds was available but we would need to check out at 11 and come back at 3 to check in again. Why would anyone do that? Sit outside for three hours (additional to the 7 we had already waited on the first day) to get a room which is what we paid for to begin with? The entire Acoster experience has been inconvient and challenging. I 100% do not recommend this hotel to anyone. Super nice hotel, super well situated, super nice staff. This hotel is in the center of Amsterdam and is close to EVERYTHING! Nice rooms with friendly staff members! The hotel is right in the middle of everything, shopping, restaurants, cafe...etc. Biggest downside was that there was no lift but would be the same for many more budget hotels in Amsterdam. it's well located, friendly staff and near the trams. We were in Amsterdam to do sightseeing. This hotel was not in the very centrum but really good enough to go anywhere. the beds were comfortable and clean. the only down side was that the internet wasn't working well in that period of time. other than that it was a nice, cosy hotel. 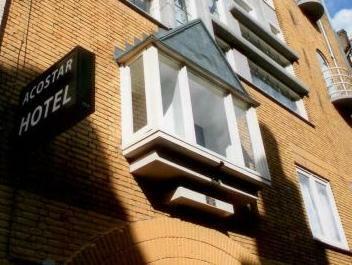 Absolutely loved our stay in Amsterdam and would definitely stay in Acostar in the future. Staff were friendly and helpful. Check in and out was a breeze. We were aware there was no lift in the hotel prior to arriving so even being on the top floor didn't bother us as we had backpacks and are young/fit. Perhaps more of a struggle if you are older with suitcases. The hotel offers free wifi - a little hard to get reception for Internet on 5th floor, so we sat in the hallways/reception to use it which was just fine. Steep staircase, no elevator. Unhelpful, rude staff. Small rooms. I always enjoy this hotel with good counter staff and security. While rooms can be tight the beds are super comfy and cosy with good light in the windows on street-side and excellent shower and bathroom facilities. hotal muy limpio. camas muy cómodas. servicio correcto. desayuno no incluído. muchas escaleras y sin ascensor. tranquilo. muy céntrico. alquiler de bicicletas. muy recomendable. Mer centralt går nästan inte att komma, det är det absolut bästa med detta hotell. Rummen är schyssta, bra standard, bra isolering så man inte hör allt liv ute från gatan. WIFI med obegränsat antal användare är kanon speciellt då vi både ville kunna surfa samtidigt på två olika enheter. Personalen var trevlig och tillmötesgående. Frukosten som var kontinental var inte värd sina €10/person. GÅ då till något café ist och ta en smörgås eller något annat. Övrigt vad det gäller bekvämligheter finns det inte så mycket, endast en automat i lobbyn om man vill ha något litet. Parkering är galet dyrt i Amsterdam ÖVERALLT, nästan iaf. Vid hotellet kostar det €5 i timman att stå nästan dygnet runt. Det finns dock två bra alternativ till detta: Park & Ride €8/dygn parkera lite utanför centrum(finns flera olika garage) och få tur och returbiljetter för de antal personer du är med kollektivtrafiken. Galet bra!!! Alternativt är att ACOSTAR hjälper er med en extern bilfirma som hämtar bilen och lämnar bilen efter angiven tid, kostnad för detta €30/dygn. Mükemmel Konum, Temizlik. Yardım sever çalışanlar. Sabah kahvaltısı almdığımız için bilemiyorum. Ama otelin karşısındaki biryerde istersek alabiliyormuşuz. Bavullarınızı son gün odayı boşalttıktan sonra emanet alabiliyorlar. Gece eğlencesine çok yakın aynı zamanda çok sakin bir otel. Yataklar rahat odalar temiz. Tek eksik saç kurutma makinası buzdolabı. Giriş katında kaldığımız halde hiç ses yoktu. Bir daha gitsem yine kalırım.